Welcome to a world of unique and uncommon experiences. 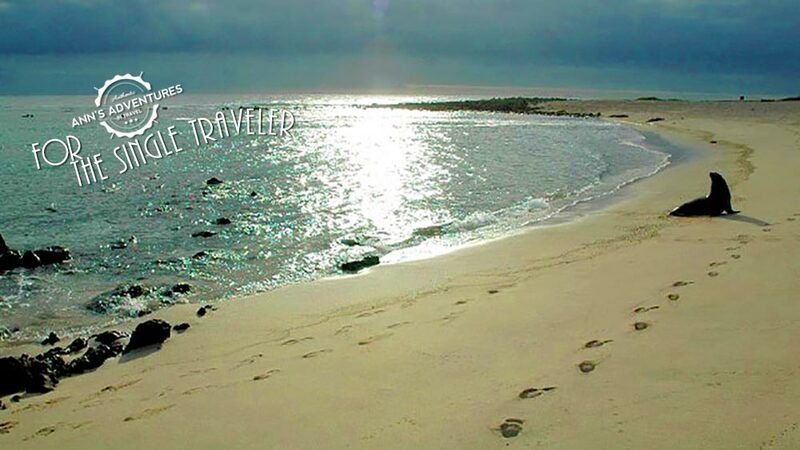 Where else in the world can you romp and play with sea lions, giant tortoises, and marine iguanas? As the birthplace of Charles Darwin’s theory of evolution, scientific history was made on the Galapagos Islands. These islands are a place of safety for wildlife and a paradise for nature lovers. The Galapagos is the only place on Earth where animals show total lack of fear to humans. These animals are very friendly and consider you as part of their environment. That is why these islands are so special. Where else can you get up close and personal with these wonderful species? Besides the animals, you will take many other memories home. There is a history to uncover, in these turquoise waters, white sand beaches, volcanic landscapes, lagoons, lava and varied and unusual vegetation. 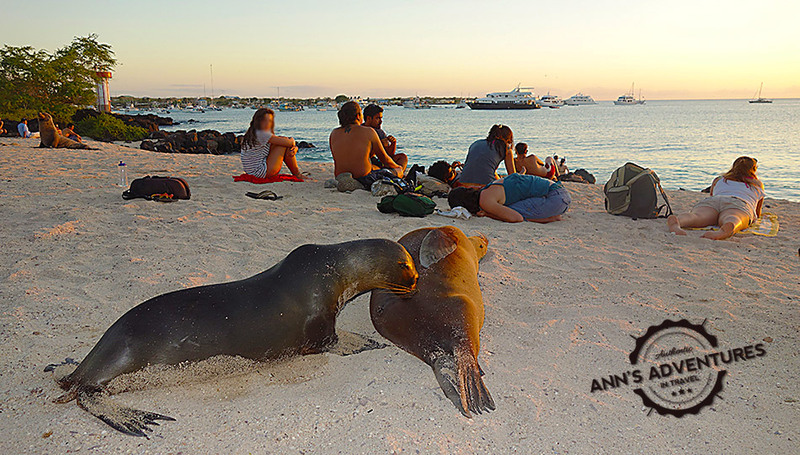 Here are some of the experiences you will never forget from a trip to the Galapagos. Because so many live on the islands, sea lions have been dubbed “the face of Galapagos.” The sea lions and their babies are everywhere in the Galapagos—on the street, the beach and in the water. You might even see one jumping in your hotel pool! They are very curious and will swim right up to you, inspect you and show off with tricks. The rule of the islands is not to approach the animals unless they come to you, no problem with these adorable sea lions. Be ready to take a lot of pictures of these adorable creatures. 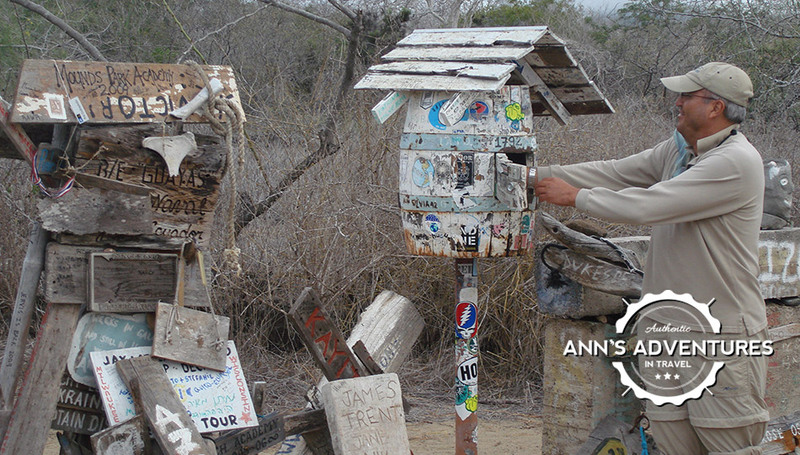 On the shores of Floreana Island is a very strange sight, a collection of barrels and signs. Centuries ago, whalers would take to the sea to hunt. The ships would spend years at a time, catching whales and processing them for oil. The island was a stopping point and homesick whalers would leave letters for loved ones to be picked up by ships on the way home. The most amazing part of this tale is that visitors still drop off letters and postcards today. See if you can find some mail to deliver! 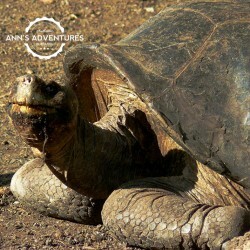 Giant tortoises are found only in 2 places on earth, the Seychelles and the Galapagos Islands. They are all over and you can actually relax with them as you would reading a book at home with your dog on your side. They are giant! 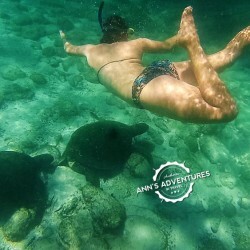 SNORKELING WITH SEA LIONS, TURTLES AND RAYS. Such a crazy experience! Some of the sea lions swim right up to you and playfully nip at your fins. You don’t need to be a scuba diver to experience swimming with these incredible creatures. Just put on a snorkel, jump in and swim. SAMPLING FANTASTIC CAIPIRINHAS AT A SALSA BAR. Although the nightlife in the islands is not as crazy as Quito, there are a few bars where you can mix with the locals, learn some salsa (or show off what you already know), and sample deadly caipirinhas (secret ingredients). VISITING PENGUINS. 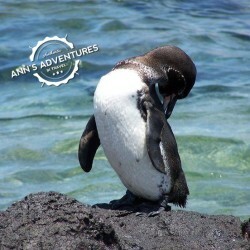 The Galapagos Penguins are the second smallest penguins in the world. They are now an endangered species. These non-flying birds look awkward when walking on the rocks, but wait till you see them move in the water at lightning speed! MEETING BLUE FOOTED BOOBIES. 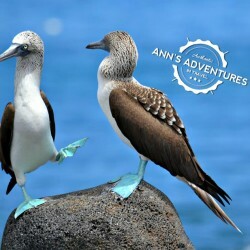 You will see many blue footed boobies here. Blue feet cover their chicks and keep them warm. Both parents do this for their babies. They take great pride in their feet and you should see the male boobies showing off with high-stepping struts during the mating season. The bluer the feet, the more attractive. WALL OF TEARS. 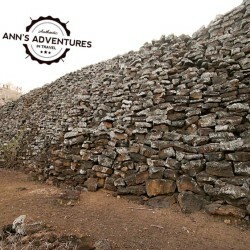 From 1945-1959 a penal colony hosted prisoners who were forced to build a wall, stone by stone, in heat and isolation. This now historical sight (El Muro de las Lagrimas), towering at 65 feet high, took the lives of thousands during its construction. People claim to hear eerie cries and an ominous aura surrounding the sight. STEALING FROM THE FISH MARKET. 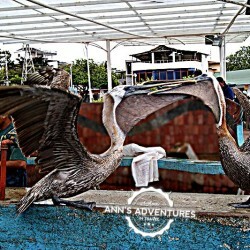 Around the fish market on Santa Cruz it is always an experience to watch what goes on. Pelicans constantly hover above, while sea lions flop around looking sad, ready to snap up a fish head or two and make the market owners feel bad. They always manage to steal something and watching it is hysterical! 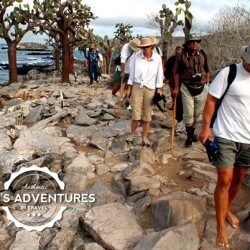 LAND TOURS NOT CRUISES ARE THE NEW WAY TO SEE THE GALAPAGOS. 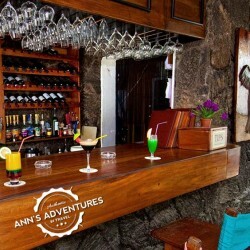 Many nice boutique hotels are on the islands and allow you to stay on land and experience meeting the locals and eating in different restaurants. You will go boating from island to island. Stay in comfort in different hotels and enjoy flexibility and freedom-more variety in your surroundings. We all need downtime during vacation, to soak up the town vibe. 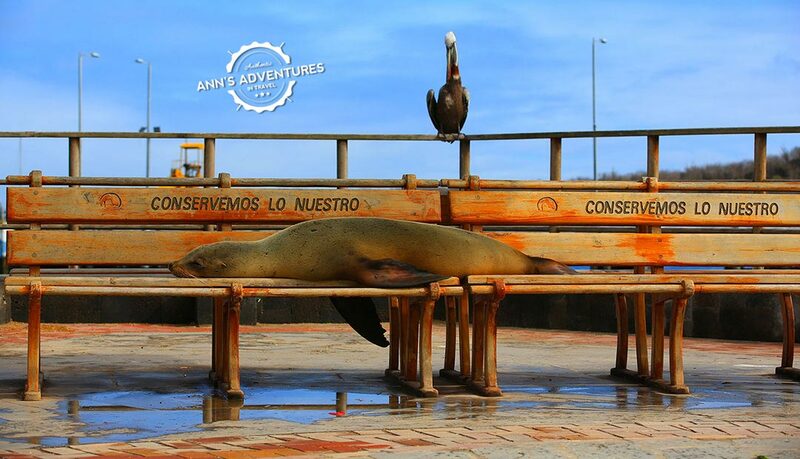 You can watch the sunset, watch the pelicans steal fish or pose on the sea edge while sea lions sunbathe . They are all too cute! San Cristobal has many pastel-colored cafes where you can sample Ecuadorian coffee or a local drink.